How does a jurist do Legal Tech? And how does an IT expert do Legal Tech? Using this perspective, it isn’t that easy. Most probably they will rather create and apply Legal Tech together, just as the wording implies. It is indispensable that all people open to such topics connect and exchange regularly. This is the foundation for new ideas and possibilities. But now to the second topic: innovation. Technology in itself usually does not constitute something outstandingly new, but rather just a new form of the existing. Wanting to make things really better, we first need to exchange, take different perspectives and to question and challenge status quo to understand why we do something and where we need it. Innovation in law is more than digitizing existing processes (thereby creating their tech-supported carbon copy). Done correctly, we question the mode of delivery in our work and find better approaches, which enable quicker, cheaper or higher quality services. And that’s most certainly our goal. We work solidly and well, but that does not mean that there is no more potential. Jointly, we can invite people who give us impulses, to learn more about methodologies and new perspectives, who challenge and inspire us to walk new paths and create new services. Ideas are plentiful (for example, legal design thinking, just to name one). To create a powerful yet open network here in the region in and around Nuremberg, Fürth and Erlangen in Franconia/Northern Bavaria, I have initiated Legal Tech & Innovation Nuremberg, Europe together with the association open Business Innovation Technology – openBIT e.V., in whose board I am also active. Besides us, three more individuals were involved, as well as the local in-house lawyer network, the “Syndikus-Kreis Franken/Nordbayern”, which we have established amongst colleagues during a time challenging for our legal status in 2014. 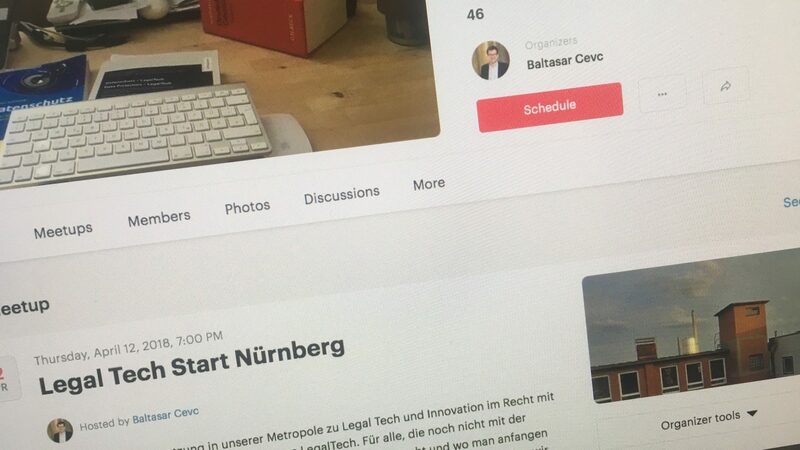 Please find further information as well as the invitation to our first meeting on 12 April 2018 at CodeCamp:N plus the possibility to register for it, and to subscribe to our newsletter (which will mostly be used for invitations) on the website Legal Tech and Innovation Nuremberg. Looking forward to an pulsating exchange. Next Post Competing over privacy?